Check out the full schedule for The OMEN by HP Bootcamp. 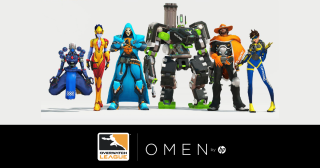 In the OMEN by HP Bootcamp at the PC Gamer Weekender on 17-18 February, attendees at the London Olympia will have the chance to learn Overwatch in serious depth from experts. Now, we can reveal the complete schedule of events across the two days—and for anyone who wants to improve their Overwatch game, it's going to be incredibly useful. Learn more on the Bootcamp page on the Weekender site, and save 20% on tickets when you use the code PCG. In our opening talk, Valkia brings you what he’s known for—taking you through the very best tips and tricks for Pharah. Watch him as he talks you through the strengths of everyone’s favourite former security chief. Frankie Ward, the fieriest support player this side of the Blizzard Studio, discusses when and where you should be pulling out your gun as Mercy, and when aggression is most appropriate as a support player. Frankie sits down with Sacriel to discuss some of the fundamentals of gear required in FPS titles—what works, what doesn’t? What should new players look to work on, and what can experienced players work to fix? Putting some of those discussed skills into action, Sacriel will take you through his favourite character in Overwatch and how the experience of playing in the Blizzard shooter can be enhanced through great technical skills. Having a broad hero pool is a key aspect of any high-level player. OverwatchCentral’s own RyanCentral takes you through the key basics of taking on a new character to broaden your pool—skills, movement, placement, role - it’s all here. Playing with a team? Get it right. Valkia talks through how team composition—that is, how to pick who you and your team should play together—is integral to surviving at the higher levels of the ladder and, indeed, progressing out of the lower levels. In the second of a double-barrelled set of talks, Valkia takes you from hero select right into the game. In that spur of the moment—how should you be communicating with your teammates—what’s too much? What’s too little? Get the answers here. Jeff Kaplan has said that hero 27 will be ‘meta-changing’, and we know that it’s nearly ready as it’s currently featuring in every playtest. Frankie Ward leads a debate about what the new hero could mean—for the average player and for the pro scene. Front line, baby. Get right up close to the action and take in some knowledge with RyanCentral’s guide on how to Tank. It’s a one-off special in his specialist area that will add something to your play whether you’re brand new to the role or weathered and beaten. Genji & Hanzo…two of the most controversial, rage-inducing, keyboard-breaking heroes in the game. Are they appropriately specced? Is their position in the meta too strong or otherwise? Frankie Ward leads the discussion. Stepping out of the game for just a few moments—RyanCentral examines something completely key to being a great player in any game. How can you avoid tilt? How can you make sure you’re coming into your playing experience with the right mindset? Learn right here. Bringing out our second world cup competitor for the first time, RyanCentral discusses being a pro, what it takes to compete on the global level and where next for the UK’s own Realzx. Taking the stage, Realzx taps into his well of knowledge on shotcalling, that is: leading the team in-game. Operating under pressure, how can you make the right calls? How do you deal with rebellious teammates? How can you bring your team to victory? Realzx bring his DPS knowledge to bear. Watch him play the hero he’s most famous for: Lucio, and take you through what he’s doing and why while he does it. Can't make it on the Saturday? No worries. Our guests be going through some of the same subjects on Sunday, too, as well as some new ones. Plus, you can see the finals of our Overwatch Competition. We'll be introducing the winners of our Overwatch Competition to win loads of great goodies, which began a couple of weeks ago. Following the Overwatch World Cup, Kruise became known worldwide for his Genji play. For the first time, see him sit down for a full hour of educational play and discussion, bringing your Genji plays right up to world class. It’s never been glamorous, but it’s always been necessary: VOD review. Realzx teaches you the most transferable of skills: self-reflection. Take note of your mistakes, take note of your greatest plays and learn from both. Learn the skills to do so from Realzx in this talk. Overwatch League is the single biggest endeavour in Esports—perhaps ever. It’s paid off in a huge way for Blizzard, but where does it go from here? How can it continue to develop the pro scene for Overwatch? How can the average player take the best from it and development from there? The finals of our Overwatch competition. Which of our talented finalists will win out?